I could not find a single good tutorial for setting up Tesseract on VS2008 other than the docs that come with Tesseract so I decided to make my own tutorial for those interested. 1. Download and install the full windows version of Tesseract. This way you won’t have to extract all the different separate files. Remember to check Tesseract Development files! ***I think you can do this with the property sheets but I don’t know how to set it up. Message me if you do! If for some reason when you run your program and you get .dll missing add these files into your project folder. Copy eng.traineddata from C:Program FilesTesseract-OCRtessdata into your project folder and it should output Hello World! The traineddata file will be used as the data file for reading the text. More to come! I will be making a tutorial maybe next week on linking OpenCV with Tesseract and maybe also on how to train Tesseract. Hi, I did what you wrote here and it works but my "C:Program FilesTesseract-OCRinclude" folder I have "leptonica" folder and some header files but I can not find "tesseract" folder! I think my setp didn't go well. can you upload this folder? does Tesseract compatible with Visual Studio 2010? 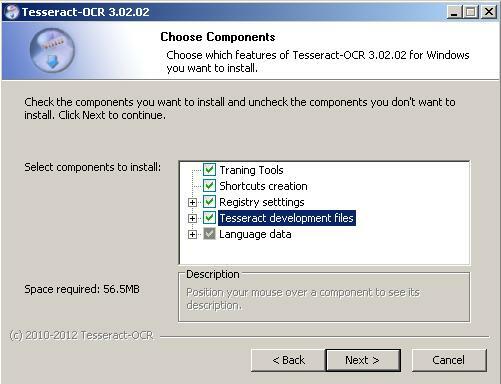 Yes Tesseract is compatible with VS 2010 but it requires a slightly different installation method. you said "Yes Tesseract is compatible with VS 2010 but it requires a slightly different installation method." libtesseract302d.lib these two files, What should I do? I followed your installation instructions. But my C:Program FilesTesseract-OCR didn't contain those files..So then I downloaded tesseract-3.02.02-win32-lib-include-dirs.zip from https://code.google.com/p/tesseract-ocr/downloads/detail?name=tesseract-3.02.02-win32-lib-include-dirs.zip&can=2&q=. and copied those files from folder to my prj folder and in C:Program Files (x86)Tesseract-OCRlib .. so finally it started working.. This is tested on VS 2010.. working absolutely fine. Please provide me appropriate solution. "http download error. Download Status of : File Not Found(404). Click OK to continue". Please tell why I am getting this error. And also provide solution to solve this error. Error opening data file ./tessdata/eng.trained data. Please make sure the TESSDATA-PREFIX environment variable is set to the parent directory of your "tessdata" directory. Failed loading language 'eng'.Tesseract couldn't load any languages. Really I cant understand this error. I have already copied eng.trained data file from TesseractOCR File to the project folder !! help me in this regard !! Thank you!! I followed your tutorial on visual studio 2008 without much problem except that some lib files and tesseract directory in include folder was missing. What I found is that if we install tesseract from the installer available at its website then this directory and lib files are not included in the package. The solution is to download "tesseract-3.02.02-win32-lib-include-dirs.zip" file from tesseract's website, unzip it, copy the "tesseract: directory in "Program Files (x86)Tesseract-OCRinclude" and missing lib files into "Program Files (x86)Tesseract-OCRlib" folder. I hope this will be helpful for the future visitors. i follow this tutorial for Visual Studios 2010 but i get this error "the program can't start because libtesseract302.dll is missing from your computer. Try reinstalling th program to fix this problem" please help me? I have done all of above step, and the sample code build success. But when I try to run/debug it, it throw exception: "The application was unable to start correctly (0xc0150002). Click OK to close the application". What might be the problem? Thank you very much. Hello Michael. Thanks for this tutorial. I know it's been ages but I just ran into the same problem on VS 2013 on windows 8, 64 bit. Any chance you could help? I'm so close. Thanks in advance for your efforts. What are the error messages you are getting? "the program can't start because libtesseract302.dll is missing from your computer. Try reinstalling th program to fix this problem". libtesseract302.dll and libtesseract302d.dll into your solution folder. 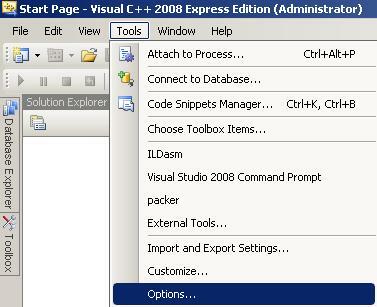 Santhosh Bander, with C++ in Visual Studio 2012 we do similar, you see in the tail an arrow button, select edit and do the same with above. It worked in VS 2010.
hello, first like to apologize for my typos. I'm having a little trouble installing the version 3.2.02 on windows 7 x86, and import the library in microsoft visual stuidio 2013.
it could be possible to make a tutorial. 1>Build started 9/10/2014 12:46:31 PM. So can anyone please help me to solve this error? I'm using visual studio 2010 in a 64 bit computer. FYI, i'm in the midst of learning on how to develop a text signage recognition mobile application in Android. 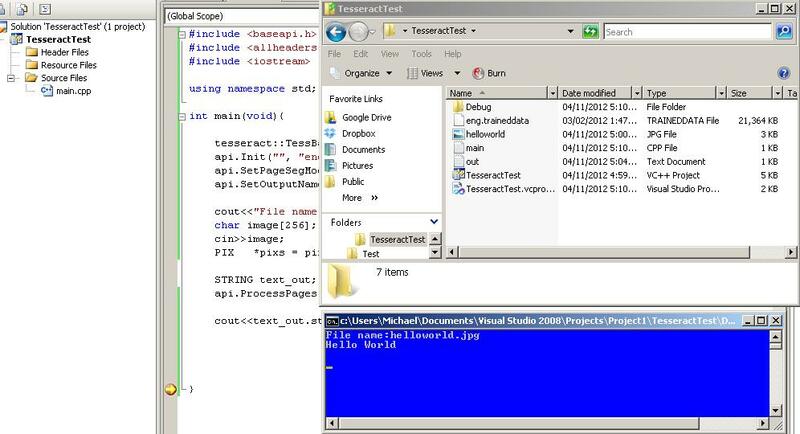 I decided to use Tesseract and OpenCv and integrate both of them in Visual Studio 2008.
" 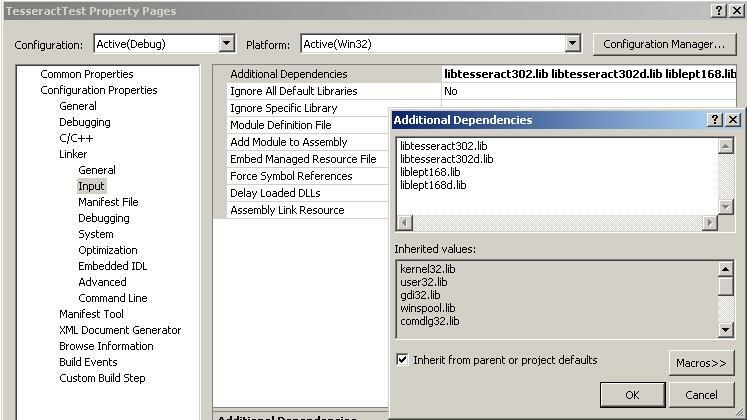 1>c:usersintandocumentsvisual studio 2008projectstesseracttesttesseracttestmain.cpp(1) : fatal error C1083: Cannot open include file: 'baseapi.h': No such file or directory "
I think you forgot to connect any library “baseapi.h”. Try to decompile any apk file and deal with a mistake in reverse. Try to and I’m sure you’ll solve your problem fast. Good luck. Hi Michael,thank you for your post. i am getting these errors in visual studio 2013,please solve me out.these errors are from headerfiles. Error 2 error C4996: 'strncpy': This function or variable may be unsafe. Consider using strncpy_s instead. To disable deprecation, use _CRT_SECURE_NO_WARNINGS. Want to tell you great way how to solve your problem with missed .dll library files, it's very simple way. You need just download missed .dll library file from http://fix4dll.com/msvcp110_dll and add it into the right directory follows the instructions. Try to and I'm sure you'll solve your problem fast. Good luck.